Gel Loading Dye, Purple (6X) is the premier gel loading dye from NEB for sharp, tight bands. Our Purple Gel Loading Dye sharpens bands and eliminates the UV shadow seen with other dyes. Available with or without SDS (NEB #7025). Gel Loading Dye, Purple (6X) is a pre-mixed loading buffer which contains a combination of two dyes, Dye 1 (pink/red) and Dye 2 (blue). The red dye serves as the tracking dye for both agarose and non-denaturing polyacrylamide gel electrophoresis. The two dyes separate upon gel electrophoresis; the red band is the major indicator and migrates similarly to Bromophenol Blue on agarose gels. Specifically chosen, this dye does not leave a shadow under UV light. This solution contains SDS, which often results in sharper bands, as some restriction enzymes are known to remain bound to DNA following cleavage. EDTA is also included to chelate magnesium (up to 10 mM) in enzymatic reactions, thereby stopping the reaction. The dye also contains Ficoll, which creates brighter and tighter bands when compared to glycerol loading dyes. This product is packaged as 4x1 ml vials. Attention SYBR® Safe and GelRed™ dye users: Due to an increased concentration of SDS* in B7024S, NEB recommends using Gel Loading Dye, Purple, No SDS (6X) (NEB# B7025S) instead. *Compared to NEB# B7021 and NEB# B7022. Nucleic acid samples were run on an agarose gel, with either Purple or Blue loading dyes. Both dyes ran at the same speed. 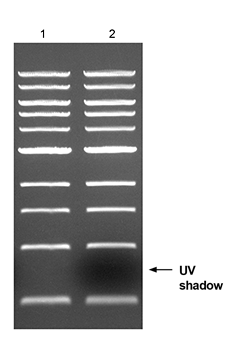 The new Gel Loading Dye, Purple (6X) (Lane 1) included in the Quick-Load Purple 1kb DNA Ladder does not cast a UV shadow over the underlying bands, unlike the Gel Loading Dye, Blue (6X) (Lane 2). Use 5 μl of Gel Loading Dye, Purple (6X) per 25 μl reaction, or 10 μl per 50 μl reaction. Mix well before loading gel. Due to an increased concentration of SDS in NEB #B7024, NEB recommends using Gel Loading Dye, Purple, No SDS (6X), NEB #B7025 instead. 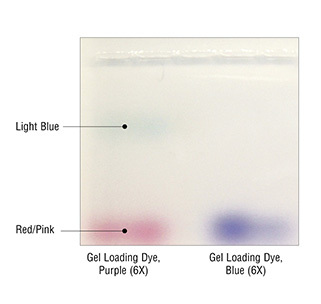 Does the Gel Loading Dye, Purple have any advantages over the traditional Blue Loading Dye? How many bands of color should I see on the gel? I cannot see the blue dye when I run it on a gel. Why not? Why is there SDS in the dye? Can I use the Gel Loading Dye, Purple with the QIAquick Gel Extraction Kit? How are the 6x loading dyes packaged? SYBR® is a registered trademark of Life Technologies Corp.
GelRed™ is a trademark of Biotium.